More than a quarter-century ago I copied this week’s parade scene from an album of 1911 Golden Potlatch subjects generously loaned to me by collector/dealer and friend Michael Maslan. 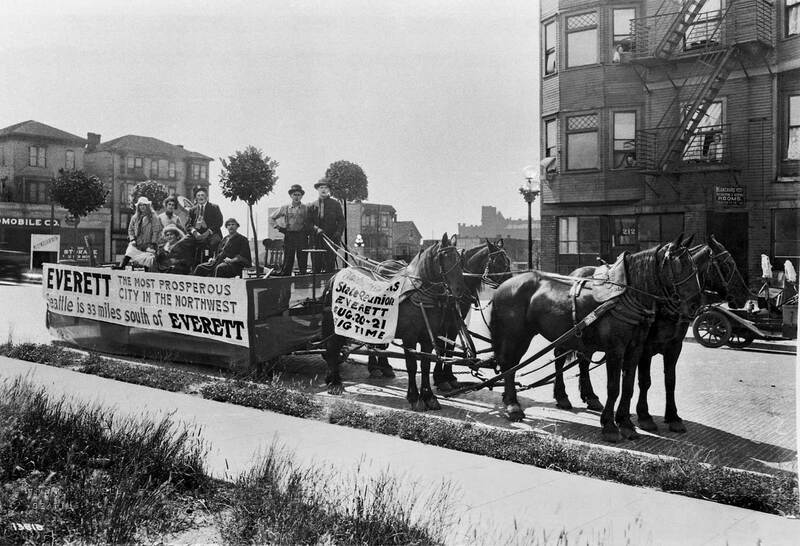 The intended subject is quite peculiar – a sort of float with four bushes pruned like small trees decorating the corners, a comfortable ensemble of half-costumed characters, two teamsters, two teams and two signs. 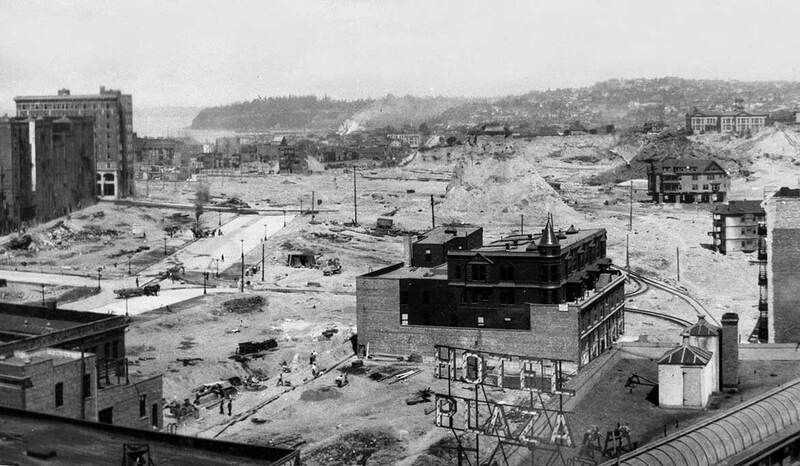 Most readers probably know that the setting here is part of the Denny Regrade, and not so long after it was scraped from Denny Hill. 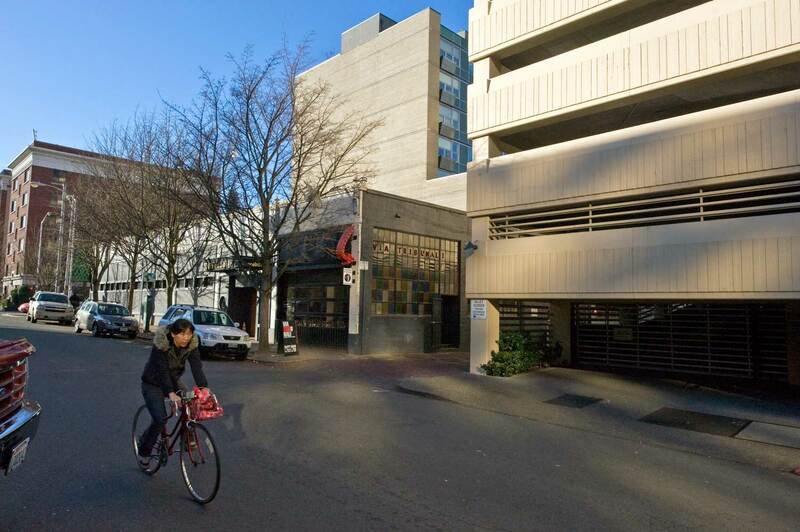 This block on Blanchard between Third Avenue (off-frame to the right) and 2nd Avenue (on the left) was one of the steepest on the hill and negotiated by steps only. Before the carving began the block climbed west to east 58 feet from 170feet (at 2nd) to 228 feet (at 3rd) above sea level. After the grading it climbed gently in the opposite direct, from east to west, and at a much lower elevation throughout. These regrade changes were made by blasting the hill with jets of eroding water. Of the several hundred structures on the hill few were saved. 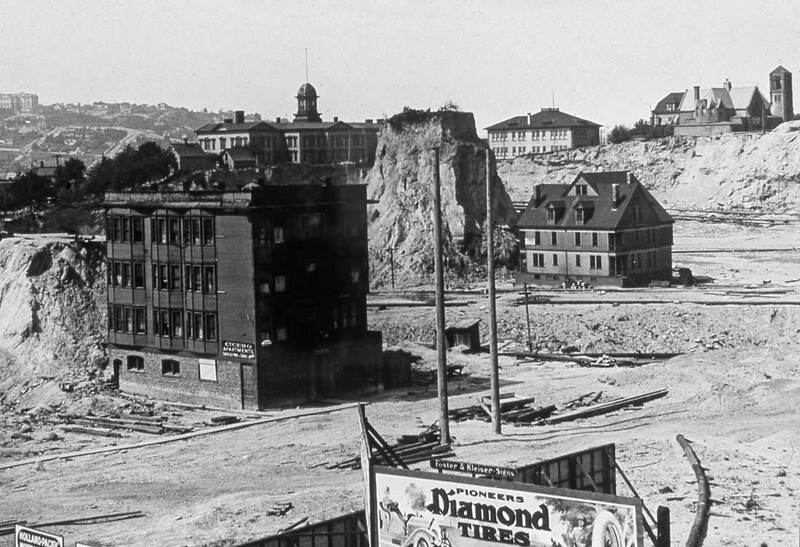 However, the Blanchard Apartments shown here was one of two big buildings that were carefully lowered with the hill. A cheap three-story tenement (with three tubs and four toilets for 21 one-room apartments) it was lowered to a new brick first floor with two storefronts. 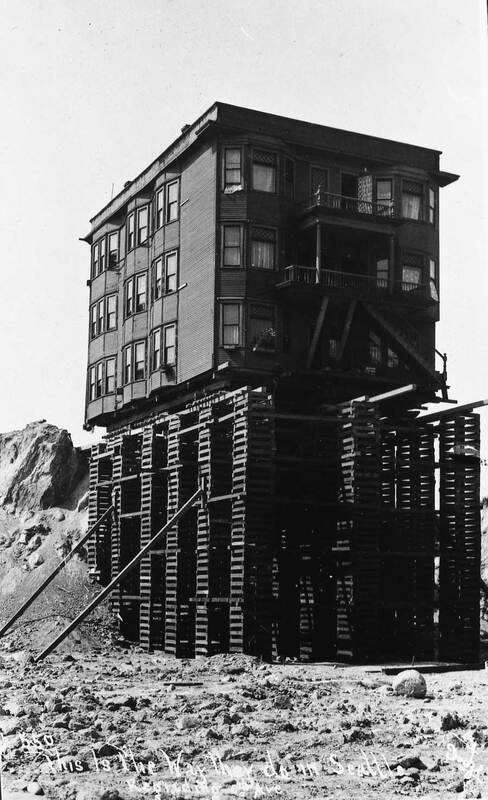 Built in 1900 – only five years before it’s descension – it kept wearing out until it was razed in March of 1972. “Run down inside and out” is how the surviving tax card describes it. 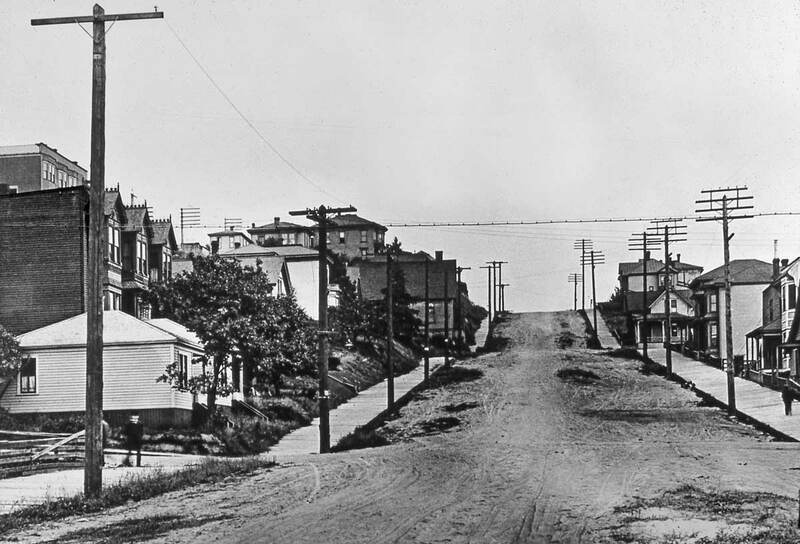 The Blanchard Apartments are still in place, upper-left, although the Second Avenue Regrade (an early part of the Denny Hill Regrade) has been completed - between 1903 and 1906. In the distance are both the white Moore Theatre at Virginia and the New Washington Hotel at Stewart. The original photograph was recorded by the Webster Stevens studio and is used here courtesy of MOHAI. 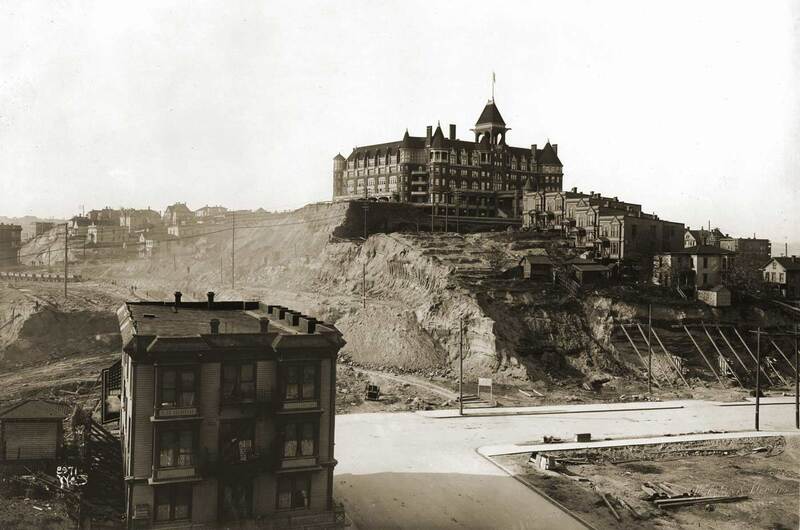 Here the Second Avenue regrade is still underway, and the old Washington Hotel (first named the Denny Hotel) is still in place on top of the southern summit of Denny Hill where it would have straddled Third Avenue - could Third have climbed the hill. The south facade of the Blanchard Apartments are apparent on the far left - in the sunlight. (Not the structure that is the farthest to the left. That one is on the west side of Second and closer to the photographer.) The structure bottom-left appears frequently in our recent posting (last week actually) showing Second Avenue south from Pine Street. This view was taken from Pike and Second. 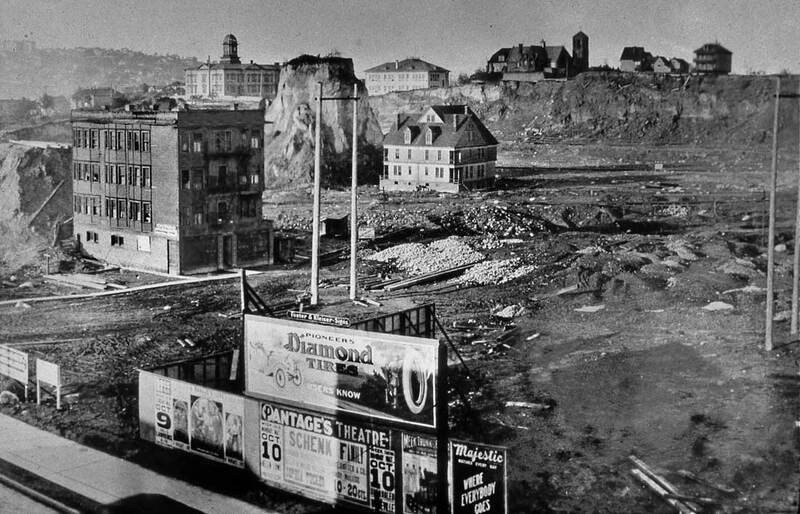 In this section of a 1908 panorama taken from Duwamish Head both the Moore Theatre and the New Washington Hotel are in place as the front "hump" of Denny Hill has been removed. On the left, however, we can make out the west facade of the Blanchard Apartments clinging above the cliff at Second and Blanchard. We can also detect some of the scaffolding for the Lenora Street flume that carried mud from the regrade out into the bay. A new flume was built off of Bell Street for the second and larger regrade south of Virginia Streeet. This year that razing of the hill's southern hump and so also the lowering of the Blanchard Apartments began. In the distant horizon is the Volunteer standpipe with its exterior brick facade in application (if I am reading it right). The complete panorama from which this section has been lifted appears on our web-page dedicated to some of the pages from our book Washington Then and Now. Google it. There are also pans from 1907, 1910 and 2006 for comparison. 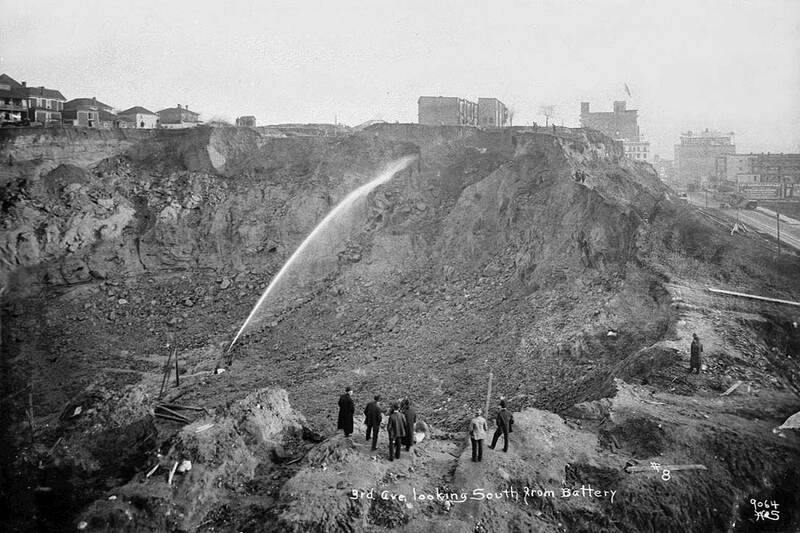 The regrading is underway south of Virginia Street - eroding the northern summit with water canons. I have embraced the opinion that this view was taken from the Blanchard Apartments before they were lowered. I have, however, not attempted to prove it. The old Broadway High School is evident on the horizon left of center. So the view looks east. This was photographed by the prolific postcard producer Frasch. This also has a chance (for future confirmation or rejection) of being photographed from the Blanchard Apartments. It is an earlier recording than that shown directly above. The Wesbster and Stevens studio's own caption that it is "3rd Ave. Looking South from Battery" is twice wrong. This is Second Avenue on the right. As noted here the grade change on Second Avenue at Bell Street before and after the regrade on Second amounted to very few feet. Battery is one block north of Bell. This, if I am correct about the Blanchard Apt. prospect, is one block south of Bell. On the right the top floors of the New Washington Hotel (with the flag) reach above the old grade. Lowering the Blanchard Apartments. I have temporarily lost a negative of the Blanchard resting on top of its "spike," the name for the mounds that were left temporarily by the regraders as their canons ordinarily attacked the hill from its streets. I'll put it up when I find it. This view and the one below it look from some surviving structure on the west side of Second Avenue to the northeast and so cut diagonally across both Second Avenue and Blanchard Street. Notice that the Blanchard Apartments are hear identified as the Cicero Apartments by the sign on the west facade just above the building's new concrete and brick foundation. 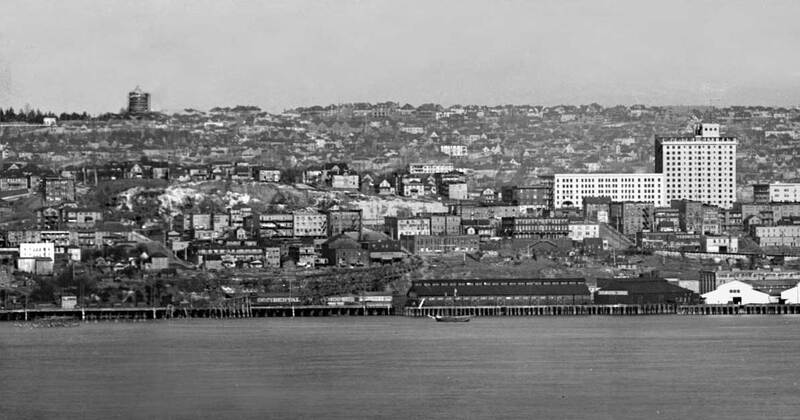 The horizon includes much of the new (1909) Ballard High School on the left, and Denny School (1884), the tower above the Blanchard Apartments and left of the surviving spike. The big residence - probably a boarding house - just south (right) of the spike was skidded there from a location about one block to the east. Sacred Heart Parish is on the right horizon. 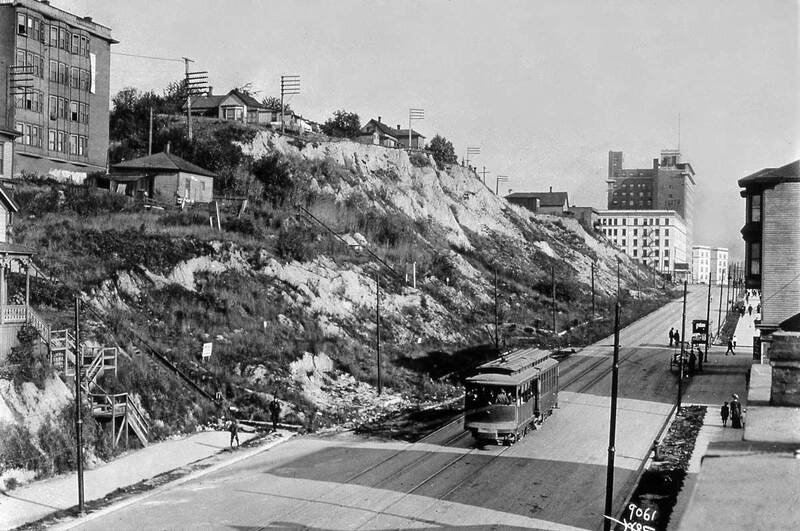 Both Denny School and Sacred Heart survived there until the regrade picked up again in 1928 at the cliff it left to stand for 18 years along the east side of 5th Avenue. After the regrading reached it in 1911 they temporarily stopped. 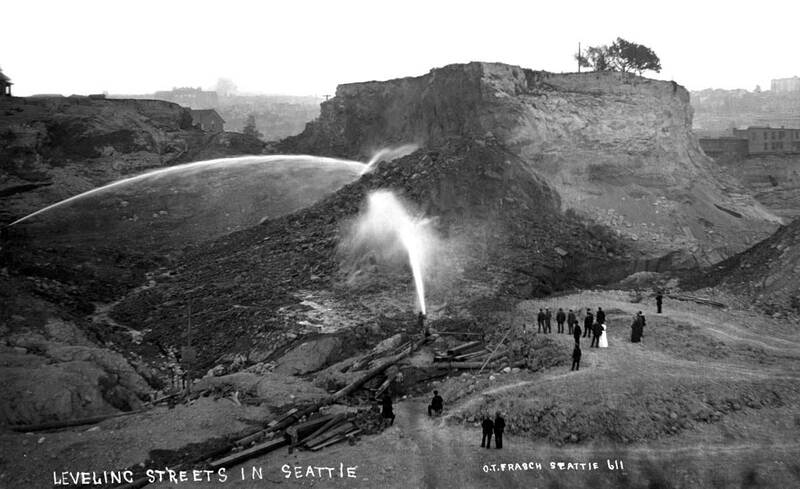 The work began again in 1928 they used steam shovels and conveyor belts - not water cannons and flumes. There are many small differences between this view and the one above it, which was taken from the same upper story window of a structure on the west side of Second Avenue and south of Blanchard Street. There is also one big difference. A subtraction. Can you find it? 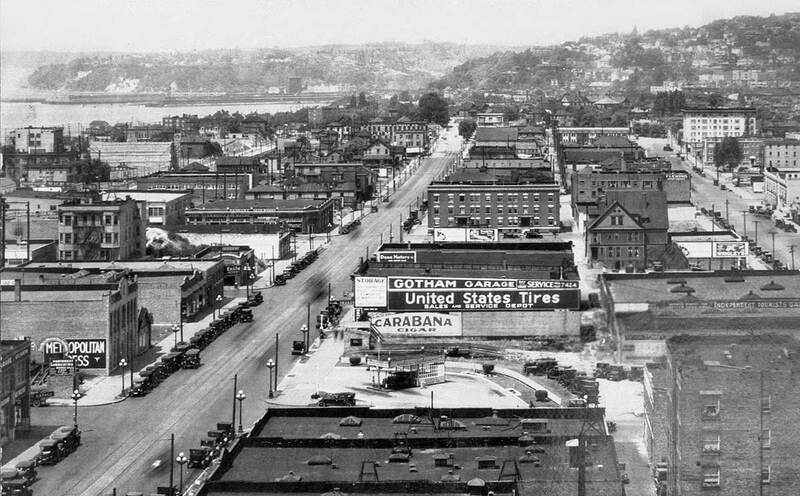 This view looking north from the Seaboard Bldg at the northeast corner of 4th and Pike offers a clue for answering the challenge given at the end of the caption for the view directly above. The multi-story Calhoun Hotel at the northeast corner of Virginia and 2nd (across Virginia from the Moore Theatre) is on the left. That is not the clue. Far right the regraders are giving shape to the cliff on the east side of 5th Avenue. The extended work of Denny School, with both its west and east wings in tact, shows at Fifth and Battery. And that is the clue - or give-away. Of course, the Blanchard Apartments also appear in this scene, left of center. One block of Third between Stewart and Virginia has been freshly paved.